My undergraduate thesis question was “How to reduce sedentary behavior in children?”. My research showed that the prime cause of sedentary behavior in children was screen-based entertainment. Television, videogames and mobile devices such as tablets and smartphones are the leading cause of the reduction in physical activity in school-aged children. Due to the fact that children have a strong desire for digital, or interactive, forms of entertainment, my proposed solution to the problem was a screenless digital gaming console that requires physical activity as the primary mode of interaction. 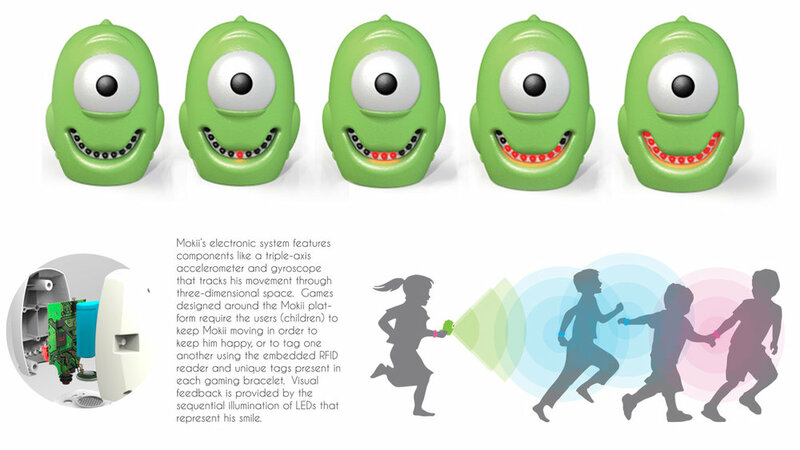 Mokii, the main character on which the product is based ( whose name is an acronym for “Mobile Kinetic Interaction” ) allows children to play a variety of preprogrammed games, the object of which is to keep Mokii moving. The premise of these games is that the more Mokii moves, the happier he gets. His level of happiness is measured by the size of his smile, represented by a curved linear array of LEDs. RFID-enabled bracelets provide a way for the system to track which child, or team, is in possession of Mokii, or reaches his spaceship first ( the docking console ). As part of the submission requirements for the project I submitted a fifteen thousand word written research report, as well as fully realized designs, drawings and prototypes, in addition to a manufacturing cost analysis for if the product were to go to market. The Mokii character is the main focal point of all the games. Embedded sensors allow Mokii to keep track of his movement ( think of a fitness tracker combined with toy ). Children are encouraged to carry him around, pass him around and to keep him moving in general. If the onboard sensors detect that he is stationary, or not moving an adequate amount, his smile begins to decrease in size. 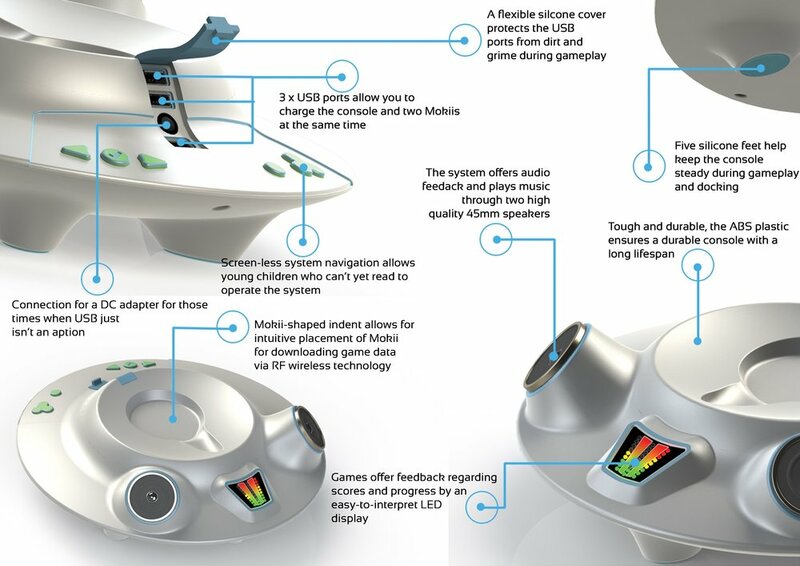 Mokii’s spaceship acts as a charging station, as well as a source of audio feedback. Several of the games have been designed to have Mokii returned to his spaceship at different stages, or at the conclusion, of several games. The bracelets, worn by each player, contain magnets that allow for a one-size-fits-all wrist strap. Each bracelet contains an RFID that allows Mokii, and the console, to identify each user - for example which player is carrying Mokii during each stage of a game.